The Democratic Women’s Union (DWU) of the National Border Area in the North Hamgyong Province declared that the number of women crossing the river has decreased because of the 150-Day battle. Of course, there were still women crossing the river, but the number of women crossing the river decreased largely in the past two years. The DWU surmises that the efforts of labor mobilization and education business prevented women from thinking about crossing the river. In Heoryong City, women suffered difficult days due to the construction work during the 150-Day battle. In Onsung City, there was a problem of rich women who missed work by paying large sums of money. The DWU chairwoman and vice chairwoman received bribes and exempted the rich women from having to work at the construction site. They were also accused of embezzling the money collected for taxes and the chairwoman resigned. Despite these events, the financial burden on women continues….Because of the 100-Day battle, which started recently, the DWU members receive lectures daily. Women are complaining because of the demands to either pay fees or work harder. Onsung county is where US journalists Laura Ling and Euna Lee were apprehended, and due to its extreme remoteness from Pyongyang (at the northernmost point of Korea) and proximity to Tumen and Yanji, we know a great deal about goings-on in Onsung. Let’s hope that the memoirs being penned by Ling and Lee don’t focus only on their abstract ideas of sisterhood or on obfuscating sources in the underground railroad movement in China, but on the everyday lives of women in Onsung — obviously the raw material for such discussion exists and is worth more discussion. Last October 11, the National Safety and Security Agency of North Korea announced that a South Korean spy network is being formed. North Hamgyong Province and other border area are in search of spies in response. On October 15, the Border Defense Security Command was ordered to begin cracking down against spies who are selling confidential military information for financial gain. The initial surveillance targets are individuals smuggling goods by bribing border patrol guards and people who travel to China to visit relatives. Officials are strengthening supervision of family members with missing relatives and defectors. All security agents from the brigade visited Sanha Battalion and began a political campaign with all high ranking officers and soldiers. They emphasized that there will be severe punishment of all crimes committed at national border areas. They are also calling on residents to be vigilant. Last October 19, a meeting of neighborhood unit heads was called by security officers and the superintendent of the police department and officials were told, “There will be harsh punishment for anyone found guilty in our province (North Hamgyong Province)”. They explained that a manager at a factory in Gimchaek City was angry after being fired from his job. Instead of repenting, he took his family and two other families to South Korea on a boat. A few hours after the meeting, three families from Onsung County, Jongsung District and one family from Heoryung were caught when they tried to cross into China. On the next day, provincial national security and national border patrol brigade ordered a special patrol and strict residential management. In addition, they launched a strategic plan for all border areas against “all unemployed, anyone who was paid for their work and do not go to their workplace, anyone who doesn’t attend work, anyone with 8.3 (absentees who pay money to avoid work), anyone who does not go to work without a doctor’s note, anyone with repeated troubles, anyone with a criminal record, anyone with a defector in the family.” They ordered the head of the neighborhood units to help security agents in charge. Their instructions included a check for those who are sick and staying home from work. Neighborhood leaders were expected to talk to physicians to check the validity of an absentee’s excuse, verify how many times an individual came to visit and if the illness prevents them from working. They also need to find out in details on everyone who has traveled outside their region including their purpose, destination and people they met. Such intense security requirements are stretching the nerves of every unit and section. Things were already tense on the border this summer during the 150-day battle, with North Korean guards showing up in the most likely and unlikely places. The heightening of vigilance now might be ascribed to a renewed zeal by the DPRK regime to show China that it has the refugee problem firmly under control. Pyongyang, November 25 (KCNA) — Upon receiving the news that bereaved children of revolutionary martyrs arrived in Pyongyang from various places of east Manchuria, China, the anti-Japanese heroine Kim Jong Suk called all of them to her residence on a day of June Juche 37 (1948). 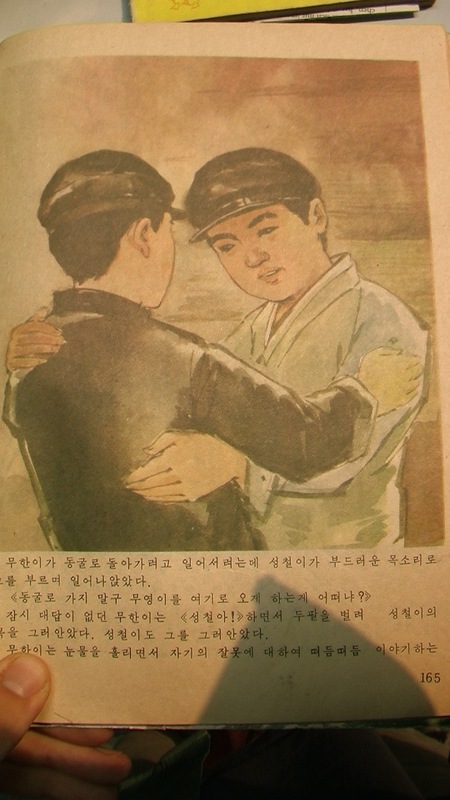 She rushed at a breath to the children entering the front gate and embraced them, saying in an emotion-charged tone: Why are you coming now from where and do you know how much effort General Kim Il Sung has made to find out your whereabouts for nearly three years following the liberation? She also asked them in detail how many days were required to come to the motherland, by what they came, whether there were children who felt train-and car-sickness and how many children remained there. Reading carefully their faces as if she tried to find features of her beloved fallen comrades-in-arms and gave prepared foodstuffs to every child. Seeing a child who was wearing trousers worn out at the knees, she said that she would patch up the torn trousers. A woman official suggested that she would do it. Kim Jong Suk said to the following effect: As the comrades-in-arms placed their children under the care of the General, when they were dying on the battlefield, I am their mother now and I must patch it up. In the post-Kim Il Sung era, it is practically impossible for the DPRK to pose itself as a legitimately and benevolently parental force for starving children. That the regime is able to put out propaganda which simultaneously hearkens back to “the loving care of the fatherly leader” and sends a message to China about crackdowns on cross-border traffic is, I suppose, testimony to Kim Jong Il’s ability to multitask.